A child’s learning of any subject hugely depends on the teaching methods employed by the teachers. Same is the case with children while learning Abacus. It is therefore essential for premium Abacus education service providers like Master Mind to use quality teaching techniques so as to deliver the best to the students. Hence, we have structured unique techniques for teaching Abacus to kids. Let us understand one of these techniques in detail. This method ensures active participation of each student in the class. 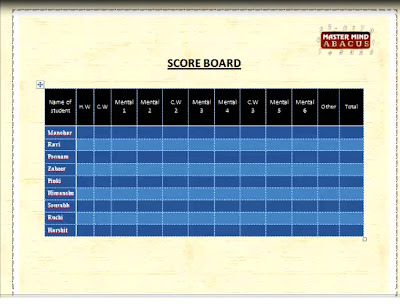 In this method, the performance of all the students inside and outside classroom are recorded on a score board. They are awarded points for each time they answer correctly, complete their homework or more such activities. The score board is displayed in the classroom for others to know who stands where at present. In this way, students become competent and put it more efforts to become the highest scorers. At the end of each activity, the winners accumulate points for which they are rewarded. This method also drives complete and personal attention from the trainer to each and every student. This results into an overall development of the whole batch. Follow us to read more about the Abacus teaching techniques in Part II and get aware about how Master Mind offers the best Abacus course in the industry. Well, thanks for the information Isha. In fact teachers play the most important role in student's learning. That is the reason in every institutes there are skilled and trained teachers.